The Algarve is not only Portugal’s foremost tourism region. Uniquely Mediterranean in an Atlantic country, its building customs have long been markers of historical and cultural specificity, attracting both picturesque driven conservatives and modernists seeking their lineage. Modernism, regionalism and the ‘vernacular’ – three essential tropes of twentieth-century architecture culture – converged in the region’s building identity construct and, often the subject of strictly metropolitan elaborations, they are examined here from a peripheral standpoint instead. 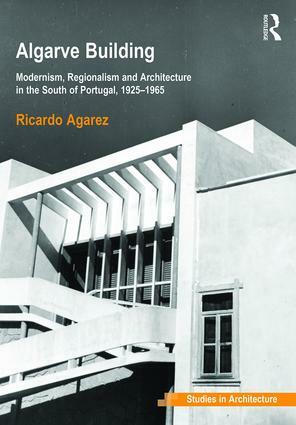 Drawing on work that won the Royal Institute of British Architects President’s Award for Outstanding PhD Thesis in 2013, Algarve Building challenges the conventional inclusion of Portuguese modern architecture in ‘Critical Regionalism’ narratives. A fine-grain reconstruction of the debates and cultures at play locally exposes the extra-architectural and widely participated antecedents of the much-celebrated mid-century shift towards the regional. Uncelebrated architects and a cast of other players (clients, officials, engineers and builders) contributed to maturing a regional strand of modern architecture that, more than being the heroic outcome of a hard-fought ‘battle’ by engaged designers against a conservative establishment, became truly popular in the Algarve. Algarve Building shows, more broadly, what the processes that have been appropriated by the canon of architectural history and theory – such as the presence of folk traditions and regional variation in learned architecture – stand to gain when observed in local everyday practices. The grand narratives and petites histoires of architecture can be enriched, questioned, revised and confirmed by an unprejudiced return to its facts and sources – the buildings, the documents, the discourses, the agents and the archives. Ricardo Agarez is an architect and architectural historian trained in Lisbon and London. He has specialised in the buildings and cities of the nineteenth and twentieth centuries, having published widely on national and regional identities, knowledge dissemination and circulation phenomena, housing and public architecture and the architectural culture in bureaucracy. Ricardo currently lives and works between Belgium, Portugal and the United Kingdom.